The first commercially produced playing machine. It worked by vibrating the stylus up and down whilst moving across the cylinder (Hill and Dale method). Prices dropped from $150 in 1891 to $20 in 1899. Cylinders were 50 cents each. The Columbia Graphaphone Type Q also known as a QC with lid, was one of the Columbia lowest priced Phonographs selling at a mere $7.50. Made between 1903 and 1905 it plays standard 2 minute cylinders compatible with Edison�s Phonographs. After Sumner Tainter and A.G.Bell of telephone fame got together and produced the first wax cylinders Edison started producing his Phonograph using wax instead of his foil type cylinder, contesting in court that his patent had been infringed, this went on for two years during which, his own product was limited in production. Tainter and Bell succeeded in getting a patent for there wax process and the two companies continued in opposition. This model of the Tournaphone was made in Germany under license before the First World War. Note:- these machines use a jewelled stylus not a needle. The word gramophone was first used by Alexander Graham Bell when he developed a machine using flat records instead of cylinders, but the principle was the same as Edison's Hill and Dale method (stylus vibrates up and down). Emile Berliner, a German American, first produced flat records that vibrated the stylus from side to side (the opposite of Bell's design). The Tournaphone was a design developed by 'PATHE' in 1906 and plays Hill and Dale records at 90 rpm starting from the inside moving to the outside. It was easily changed to play ordinary 78 rpm records by turning the sound box, and replacing the jewelled stylus with a needle. 78 rpm records continued till the 1950's, the museum demonstrates 78rpm records on several gramophones including the Tournaphone. The Edison Fireside was a compact phonograph that was introduced with the release of four-minute records in 1908. This model was immediately very popular, the mechanism has a factory-installed switch for choosing 2 versus 4 minute records, the Model K reproducer has a swivelling stylus for different types of cylinders, and the horn is the small maroon Morning Glory type. Type 'A' indicates the first in the series of this model. 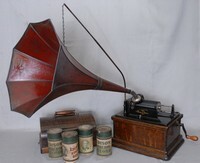 This type of gramophone was a favourite with Officers during the First World War. There have been many reports of Officers enjoying records behind the lines and some units have been found with bullet damage. These are two minute cylinders played at 160 revolutions per minute, for use with item A0534 the Edison Standard Phonograph. Called gold because of the new process used to make the master in 1902. Edison ceased making cylinders in 1929 when his Phonographic Company closed down. Designed to be fully portable in a box similar to cameras of the period. 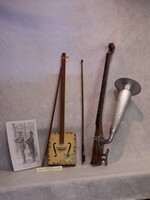 The instrument on the right is made by the inventor Charles Stroh; on the left is a home made version using a cigar box. The HMV gramophone is a model 109.
of the late 1920's, this one probably 1930's. HMV, His Masters Voice, a famous style Gramophone from before WW2 and used well into the 1960's. The original style dates from 1913. 78rpm records were still being played well into the 1960's. 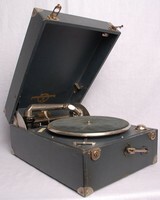 78 rpm records are still available, this player can be demonstrated in the museum. In 1899 'The Gramophone Company' the UK partner to the US Gramophone Co, run by Emile Berliner, purchased the Trademark 'His Masters Voice' using a painting by Francis Barraud showing 'Nipper' the dog listening to a Phonograph, this had to be altered at the Gramophone Company's request, to show one of Berliners Gramophones as the original had an Edison type Phonograph. 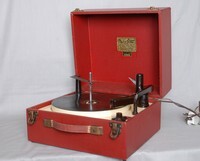 In the 1920's Electric recording was a possibility, the general public were using clockwork Gramophones to play 78 rpm records using acoustic pick ups, as Wireless sets were becoming popular it could be possible if your Wireless had a Gram input on the rear of the set to plug in an Electric pick up similar to one of these. J.B.Woodroffe patented this particular type in 1927 although many similar types were to follow, this was one of the first. It consists of a horseshoe magnet with a moveable armature attached to a standard needle, which fits into the bottom of the unit with a small knurled screw, the coils pick up the movement, and produce a variable current which is amplified by the wireless speaker amplifier. 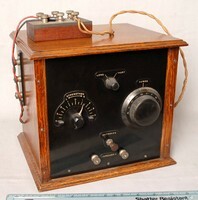 In the 1920's Electric recording was a possibility, the general public were using clockwork Gramophones to play 78 rpm records using acoustic pick ups, as Wireless sets were becoming popular it could be possible if your Wireless had a Gram input on the rear of the set to plug in an Electric pick up similar to one of these. It consists of a magnet with a moveable armature attached to a standard needle, which fits into the bottom of the unit with the magnet securing it in place, the coils pick up the movement, and produce a variable current which is amplified by the wireless speaker amplifier. The acoustic pick up of a standard gramophone is removed and replaced with the unit supplied. The lead is connected to a volume unit which in turn is plugged into the Gram input of a Wireless receiver of the period. The gramophone is used in the normal way after fitting a steel needle to the new pick up, much louder sounds of the records are now emitted from the wireless. High quality electric Pick Up for converting wind up gramophones for electric insertion to the Gram input of wireless's Gram input terminals. Made by Radio Instruments Ltd,in conjunction with Varley Ltd.
Wireless was becoming more popular in the early 30's; mechanical gramophones had been around for much longer. If the acoustic head of a Gramophone was removed and the round block with a pillar for a needle in this kit was mounted in its place, then plugged into the other section which had a 4 pin valve plug on it, the unit could be plugged into the socket on a wireless receiver that was reserved for the valve prior to the speaker valve. This would connect the new electrical pick up to the audio output stage of the receiver, thus using it as an amplifier. 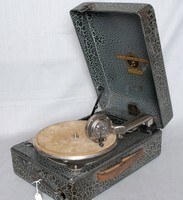 Classic style of portable gramophone with storage for records in the lid. Gramophone number 100 made in England by Columbia, the Trade Mark for EMI Records. 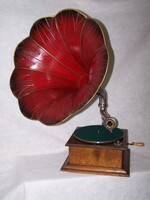 A beautiful example of the famous HMV Gramophone. The sound was fair due to the wooden box, but not as good as some horn types. The style similar to this was first introduced in 1913. Thorens is a Swiss manufacturer of high-end audio equipment. They are historically renowned for the range of phonographs (turntables) they produce. In addition to audio playback equipment, they are also a historical producer of harmonicas and cigarette lighters, most notably the button activated automatic lighter. 'A Message to the Empire' on a 78rpm record (Broadcast on Christmas Day 1935) H.M.King George V (The profits from this record were paid to Charities nominated by H.M. the King. Portable gramophone for 78rpm records, common in the 1940's and 50's. Nipper was born in 1884 in Bristol, England, and died in September 1895. It has been claimed by various sources that he was a Jack Russell Terrier, a Fox Terrier, a Rat Terrier, or an American Pit Bull Terrier. He was named Nipper because he tried to bite visitors in the leg. In 1898, three years after Nipper�s death, his owner painted a picture of Nipper listening intently to a wind-up Edison-Bell cylinder phonograph. On February 11th 1899 he filed an application for copyright of his picture �Dog Looking At and Listening to a Phonograph.� Thinking the Edison-Bell Company might find it useful, he presented it to James E. Hough who (displaying the kind of thinking that would eventually doom the Edison Records company itself) promptly said, �Dogs don�t listen to phonographs�. On May 31st 1899, Nippers owner went to the Maiden Lane offices of The Gramophone Company with the intention of borrowing a brass horn to replace the original black horn on the painting. Manager, William Barry Owen, suggested that if the artist replaced the entire machine with a Berliner disc gramophone, the Company would buy the painting. A modified form of the painting became the successful trademark of Victor and HMV records, HMV music stores, and RCA. Toy gramophone with records of nursery rhymes and short stories. Made as a cheap novelty for children during the late 1940's 50's. The Fidelity player was powered from the mains. Unlike earlier record players this one played 45rpm records, as well as 78rpm with a turn over type cartridge,using a LP stylus and a larger version for 78 records.It can play 4 speeds, 16,33,45,and 78 rpm's. The case was made from cardboard and cost �12.10s.6d. Mr. T.Cass bought one in 1959 for �2 pounds deposit and 12 monthly payments of 1 Pound,1 Shilling and 6 pence. Portable record player in a small suit case powered from the mains electricity. Normally this player would have been connected to the 'Gram' input provided on the back of some radios. Transistorised Record player and radio.